Home/Dolls/BINDI MERINDA™ Cool Begins™ Pre-order Deposit. This luxurious collection celebrates a unique set of lost 60s Australian fashion designs by the late, internationally renowned artist, Stephen Moor. The vision and talent of artistic director Jozef Szekeres has brought these designs to life with the GODs release. A meticulous attention to detail and quality has ensured that this release has not only remained true to Moor’s designs but also provides the discerning collector with a once in a lifetime opportunity. 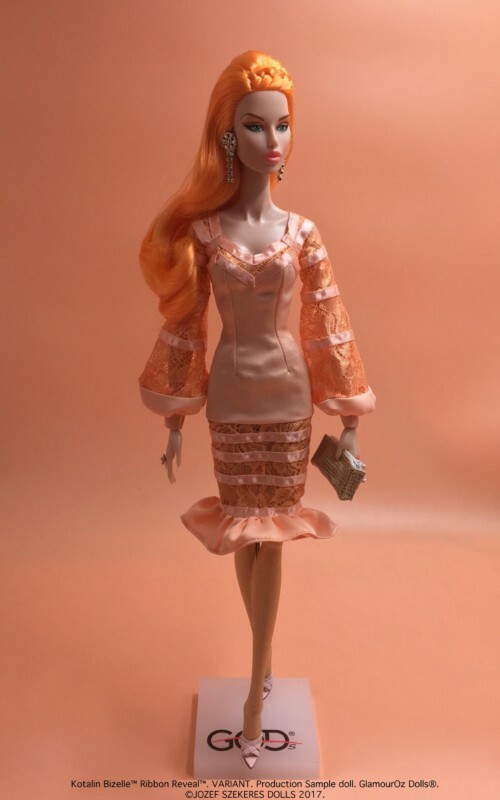 The GlamourOz Dolls Supermodels, having discovered these rare lost treasures of Australian 60s fashion are strutting the catwalks to showcase this new “old” fashion collection. Featuring the new GlamourOz Supermodel articulated body sculpt by Jozef Szekeres, that develops on the original 2003 posed sculpt aesthetic, with new character head sculpts, to create a family of fierce catwalk Supermodels. 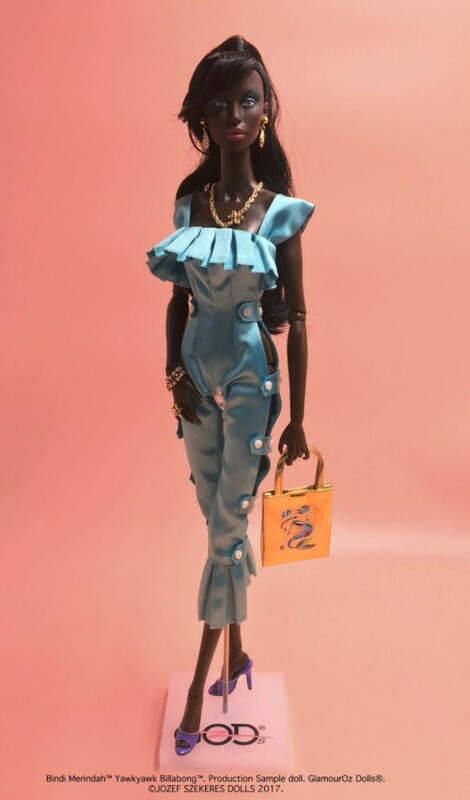 Directly available from GlamourOz Dolls, Read on for all the exciting details on how to preorder. Approximate Ship Date: Winter 2017-Spring 2018 (Shipping shortly after full payment is received). Joining Elizabet Bizelle’s return to the fashion catwalks from her 2003 to 2006 run, Australian catwalk fashion model Bindi Merinda struts the fashion lanes with her new GlamourOz Supermodel body sculpt and her beautiful new face sculpt. 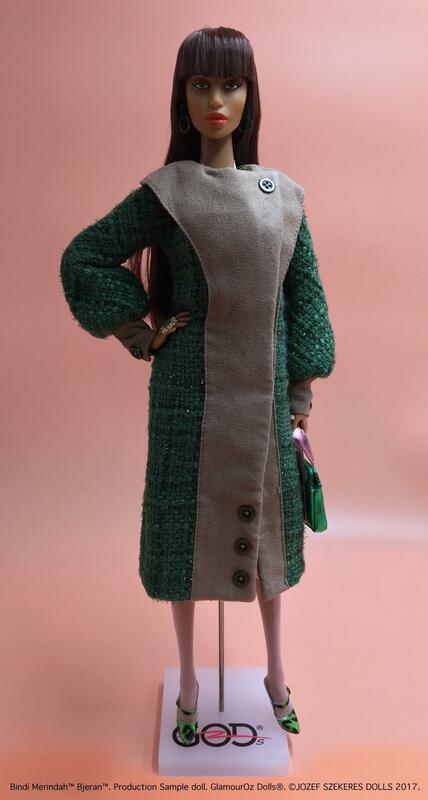 Bindi Merinda, is a 17 inch fully articulated doll with fully rooted hair and hand-applied eyelashes. Bindi comes complete with her winter jacket garment set Cool Begins, describing the beginnings of Winter. With beautiful lines, shapes and textures that embody the bush edged Australian outback, this jacket keeps her warm in the desert cool beginning nights of winter. 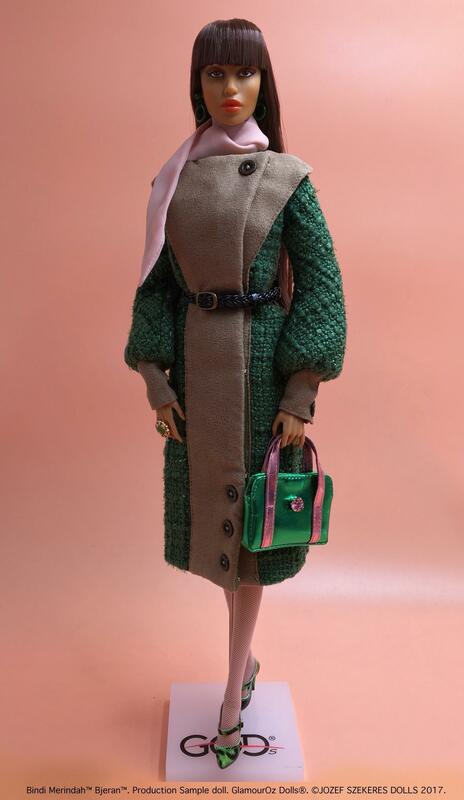 Underneath her jacket is a beautiful feminine pink halter neck pleated dress, with a matching scarf. Bindi wears green patent shoes, and carries her Green and pink handbag with a pink stone detail. She wears green earrings and a metallic gold statement ring with a green embedded stone. Her luxuriant long dark brown hair is fringed and dead straight, styled to complete the era styling. She comes with naked underwear, and her GODs (GlamourOz Dolls) Logo doll stand. 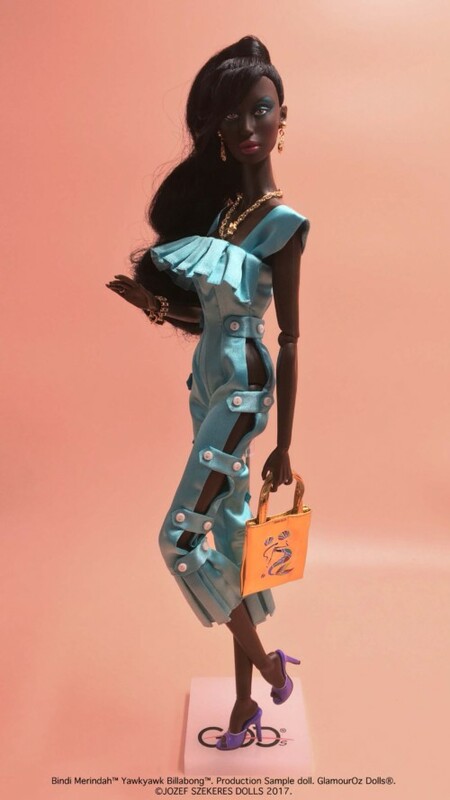 Every GlamourOs Doll is released with four sets of hands (four Right, and four Left), and two sets of feet, Fashion Heeled, and Casual Flat. For collectors aged 15 and up only. The dolls pictured are production prototypes. Final type, colours and textures of fabrics may vary. Production prototype dolls are shown with Nylon hair fibres, with final production hair fibre to be Saran, so hair colour will be similar, but will vary due to different fibre colour options. Pre-order note, please read before preordering. The pre-order deposit is non-refundable. You will be contacted to pay the remaining USD$239.00 (full retail price is USD$344.00) plus shipping and handling to be paid during the release window, when the doll is ready for shipping. Please keep in mind, that your remaining payment will not be automatically billed. Items purchased on deposit are non-cancelable. Should you fail to complete final payment within a 4 week payment window once contacted, you may forfeit your right on the pre-ordered item. When paying for your non-refundable pre-order deposit, there is no shipping option available. Your actual shipping method will be chosen by you from the options made available when you pay the remaining balance for the doll. Please ask any questions before submitting your non-refundable pre-order deposits. Please note, that by pre-ordering this GlamourOz Doll, you are agreeing to abide by the above conditions. BINDI MERINDA and all other character marks followed by ™ or ® are trademarks of GlamourOz Dolls/Jozef Szekeres Dolls. Strawberry Hills NSW 2012. All rights reserved.